The 7th Grade HAWKLIFE Shadow Visit is designed to allow interested 7th graders to experience a FULL day at the Prep and to allow each prospective student a chance to get a jump-start on the high school process. This program is modeled after the 8th Grade HAWKLIFE Shadow Visits held each Fall. Students who complete a 7th Grade HAWKLIFE Shadow Visit are strongly encouraged to visit again as an 8th grader. If you have additional questions, please contact the Office of Admission of 215-978-1958. Parent Tours - Spend your morning at the Prep! When scheduling a HAWKLIFE Shadow Visit for your son, please consider joining us for an in-depth parent tour of the Prep on a Tuesday or Thursday morning. This specialized tour gives parents a "behind-the-scenes" closer look at the Prep's academic departments and facilities. Parents will see teachers conducting their daily lessons, students participating in a variety of classes, and can be a "fly-on-the-wall" for any special events (speakers, Mass, etc.) that might be on the school's daily schedule that morning. To schedule a tour, simply click "yes" on the "Parent Tour" section of the HAWKLIFE Shadow Visit registration form. Tours begin in the Office of Admission every Tuesday and Thursday and typically run from 8:30 a.m. until approximately 9:30 a.m. during the 7th Grade HAWKLIFE Shadow Visit program. If a Shadow Visitor knows a current Prep student and would like to join him for his morning transportation routine (i.e. Prep Bus, Shuttle, Regional Rail, Subway) please note that the Shadow Visitor must report immediately to the Admission Office upon his arrival. ALL Shadow Visitors must be picked up no later than 2:45pm in the Admission Office by a parent or guardian. Questions about transportation needs on the day your son visits the Prep? Please contact the Office of Admission at 215-978-1958. >>Click here to sign up for a 7th grade HAWKLIFE Shadow Visit. The 8th Grade Shadow Visit Program is designed to allow interested 8th graders to experience a day at the Prep firsthand. Shadowing is not mandatory as part of the application process, but it is a great opportunity for 8th grade students and parents to learn more about the Prep! In the course of his day, the student will accompany a 9th grade host through his class periods and become familiar with the campus, the academic programs and the student body. The day ends with a short interview with a member of the Admissions staff. Lunch is provided. Sign ups begin in late August 2019. 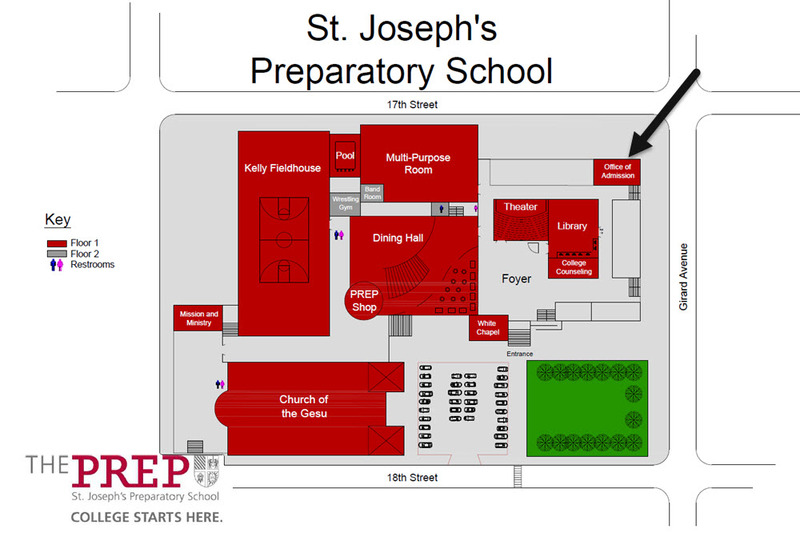 Shadow Visitors should report to the Office of Admission, through the main entrance of the school on 18th Street. Visitor parking is available in the Main Lot, in front of the Church of the Gesu. Student guests are asked to comply with the Prep dress code – a collared shirt and tie, dress pants, dress shoes, and a pull over sweater or blazer. No denim jeans or shorts. Elementary School uniforms are also appropriate. Food service is provided in the Sauter Dining Hall where students will receive complimentary lunch of their choosing from the food service line. Shadow Visitors may also bring their own lunch, if desired. The Prep kitchen is a nut-free zone. Shadow Visitors are to be picked up no later than 2:45pm in the Admission Office.